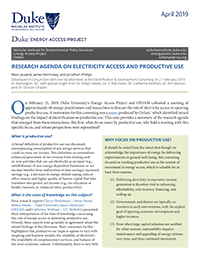 On February 21, 2019, Duke University’s Energy Access Project and Oxfam cohosted a meeting of approximately 60 energy practitioners and researchers to discuss the role of electricity access in spurring productive use. A motivation for this convening was a paper, produced by Oxfam, which had been confounded by the mixed findings on the impact of electrification on productive use. This note provides a summary of the research agenda that emerged from these interactions.